This "Sew Tiny" pattern of Becky's Bibs is perfect for all those baby flannels out there. Easy fusible applique & soft ribbed necklines make these bibs an adorable project for shower gifts as well as new family members. 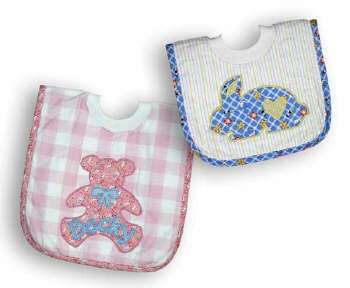 Available in two sizes (11� Infant & 14� Toddler), pattern includes appliqué designs (teddy bear & rabbit) as well as an alphabet for embellishing or personalizing the bibs.